Home » What is Therapeutic Riding? Therapeutic Riding is a fun and challenging treatment method based on interaction between people and horses. It works simultaneously on the body and “soul” by taking advantage of the natural characteristics of horses to reduce stress, and by stimulating and motivating children and adults with difficulties and disabilities. The goal is to improve physical, affective and cognitive conditions such as AD(H)D, Autism, Cerebral Palsy, PTSD, depression, delay in mental and physical development, down syndrome and other genetic and environmentally-induced syndromes, trauma and brain injuries, abuse and mental health issues. Through the horse’s natural movement, motion, and non-verbal communication, a person’s physical and mental conditions can be improved significantly. The horse is a part of the “team.” Often, people feel the horse knows his role. For instance, an at-risk child realizes he cannot use force with a horse. Instinctively he feels the horse always will be physically stronger so he needs to learn to negotiate, to control himself and plan actions. Children and adults with disabilities describe the amazing feeling of sitting high on a horse, moving independently through riding, and feeling in control of such a powerful animal. Moreover, a walking horse induces in the rider’s body, through the seat bones and pelvis, a rhythmic movement that reproduces the tri-dimensional, sequential movement of the walking pattern. Through riding, regardless of the rider’s aptitude to walk and move, the rider’s body is permanently in motion, stimulated through his sensory system, exercising muscles and joints. In our subconscious, the horse is a symbol of power and strength. This symbolism is universal. The feeling of controlling and partnering with a horse, therefore, is an empowering experience. The horse’s power is a motivator, pushing the boundaries of what one thought they could do. Horses have the ability to respond immediately and give feedback to the rider’s action and behaviors. By being so sensitive, horses have the extraordinary ability to reflect the rider’s emotion. 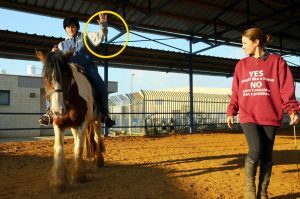 The Therapeutic Riding instructor’s mediator role reflects the horse’s reaction to the rider, establishing the basis for non-verbal communication. Soon the horse becomes a friend to whom the child or adult can whisper secrets, tell dreams and trust the horse will never judge him for the way he looks or speaks. Horses are carefully selected for calm personalities and their abilities to trust human beings. These special horses are courageous, patient and able to cope with stressful situations. They must move well to induce the correct feeling of movement. The horses are trained for this specific work. Therapeutic Riding horses must cope with stressed, unbalanced riders, uncontrolled movements and more. They therefore need to work only a limited number of hours per day, have at least one “free” day each week, be also ridden by advanced riders to maintain muscle tone and suppleness, and be able to live in the company of their fellow horses.